December 26, 2017 at 6:48 pm. 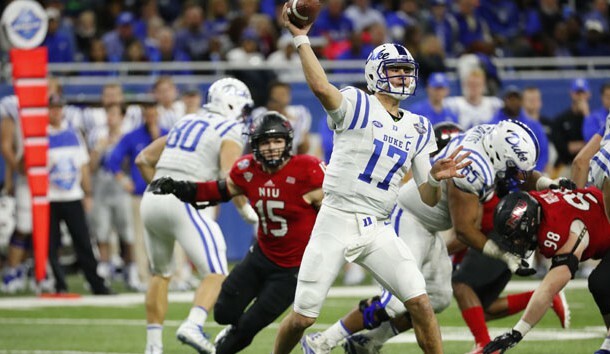 DETROIT — Sophomore quarterback Daniel Jones accounted for 338 yards and three touchdowns to lead Duke to a 36-14 win over Northern Illinois in the Quick Lane Bowl on Tuesday. Jones finished 27 of 40 for 252 yards and two touchdowns and rushed for 86 yards and a touchdown on 16 carries for the Blue Devils (7-6), who ended the season on a three-game winning streak after losing six in a row. Duke, which amassed 465 yards of total offense, scored four touchdowns in the first half to take a 26-14 lead at halftime. Marcus Childers threw for 234 yards and a touchdown for the Huskies (8-5). Northern Illinois’ Jauan Wesley caught two passes for 109 yards and a score. DALLAS — Zack Moss ran for 150 yards, and Utah’s defense held West Virginia to six first downs in a victory at the Heart of Dallas Bowl. Quarterback Tyler Huntley added a pair of 2-yard touchdown runs and Matt Gay made three field goals for the Utes (7-6), who improved to 11-1 in bowl games under coach Kyle Whittingham. West Virginia (7-6), its offense decimated by injuries to three starters and the decision by 1,000-yard rusher Justin Crawford to skip the bowl, ended the season on a three-game losing skid. All three losses occurred after starting quarterback Will Grier sustained a dislocated finger on his throwing hand against Texas on Nov. 18. Grier was on the sideline in sweats this time as the Mountaineers managed only 153 yards.